Net Entertainment is certainly one of the leading names in the industry of online gaming. This is because the developer is always adding new, original and high quality games to its portfolio. This game right here, Fairytale Legends Red Riding Hood is the newest one. The game has a fairytale theme, as obvious from the title. It also revolves around the fairytale adventures of Red Riding Hood. The game has a five reeled setup that is home to 20 wager lines across which players will place bets, and claim back great rewards. If intrigued, you can try the game right here for free, prior to playing it with real cash at any of the casinos that offer the game. Fairytale Legends Red Riding Hood has a five reeled format that houses a total of twenty wager lines. These lines have a lot of winning chances to give players. The control panel of the game isfound in its usual spot underneath the reels. It is where players will place bets, spin the reels, view the paytable, control the sounds and more. The game’s betting options allow players to have a wide wagering range. This is why the game appeals to novice players, as well as the high rollers. This betting range begins at 0.20 credits per spin, and ends at 200 credits per spin. Players will toggle through two options to create these wagers. These options are the coin value, and the betting level. 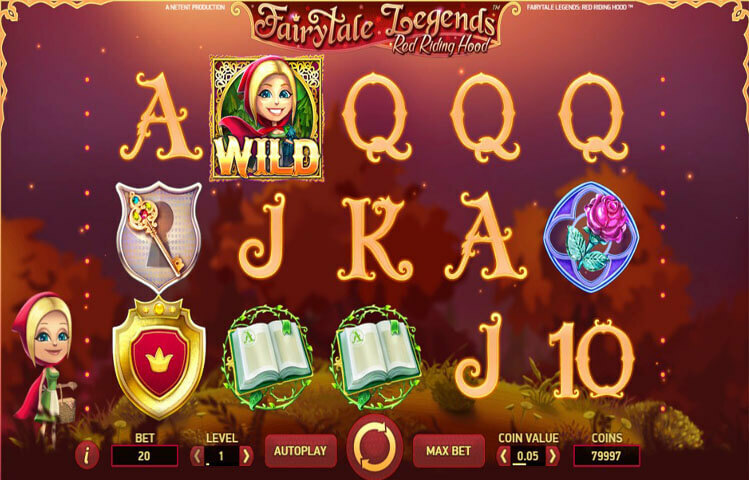 This new slot,Fairytale Legends Red Riding Hood, is certainly a visually satisfying one. The game creates the fairytale theme of the game through its wonderful graphics and animations. This is why players will see that the slot game is located in the forest, with Red Riding Hood on the left side. She will move across the forest as players spin the reels. As for the symbols, they include the Big Bad Wolf, gemstones, magical spell books, a rose, Red Riding Hood, the logo of the game as well as the usual low paying card symbols. The game takes players on a fairytale themed adventure with Red Riding Hood as she goes through the forest and meets the Big Bad Wolf as well as the fairy princess. Fairytale Legends Red Riding Hood has a wild icon, which is none other than Red Riding Hood herself. She will substitute for all icons on reels, 2, 3 and 4 during the base game. During the free spins, it can land anywhere. Also, 2 or more of this wild would trigger the sticky wild re spin, with the wilds sticking in their spot. The game also has 3 randomly triggered features that can take place during the game play such as the Fairy Tale Spins. There is also the Big Bad Wolf feature, as well as a free spins round.